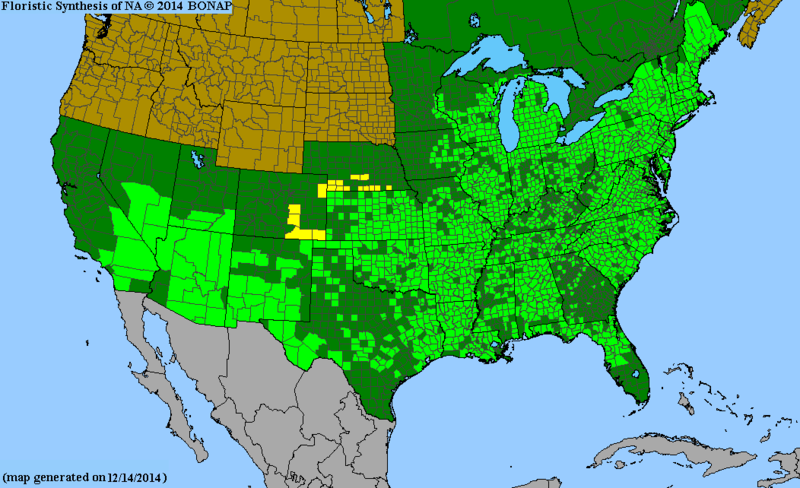 The cardinal flower ranges across an enormous territory from Mexico to Canada, including California through Maine in the United States, as you can verify on a map. You’ve got to hand it to a plant that tolerates the winters in Quebec as well as the summers in Nevada. That last location strikes me as especially surprising, given that this species has to grow near water. I’m OK with clutter, in general, but definitely like the closeup shot, that’s great and worth the extra effort. It’s a terrific, intense red. Haven’t seen it in the wild, I would have remembered. Yes, it’s hard to forget the vibrant red of a cardinal flower once you’ve seen one. Thoreau mentioned cardinal flowers in New England. I never knowingly saw one until years after I’d moved to Austin. 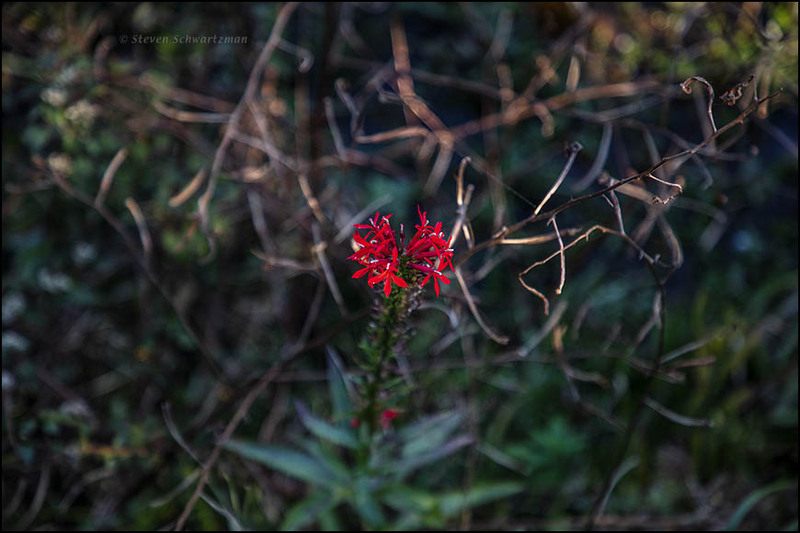 Let’s hope you come across a cardinal flower before too long. I come across cardinal flowers much less often, so I valued this one and did all I could to get a decent picture of it. You succeeded admirably. Happy Thanksgiving. Thank you. I gather that New Zealand doesn’t celebrate Thanksgiving, but I’ll wish it back to you anyhow. And happy pumpkin pie to you. The second picture is just perfect! And a happy Thanksgiving to you guys, too. Looks like you’ll have to generate some inner sunshine today in the Hill Country. Yes, the second photo is a big improvement. I wouldn’t normally show the first one, except it serves here as part of a lesson. Yes, it looks like an overcast day here in our neck of the woods. I like comparing fotos, like I sometimes do in my “before and after” series on my “Bilderbuch Blog”. As I’ve said so many times: Once a teacher, always a teacher. Yep: I can’t help it! Me too. That’s a main reason for hosting this blog. Well, agreed – of course. Both are beautiful photos. I like when I can see the subject in its environment, but of course, the close-up is less cluttered and focuses the eyes on the intense red petals. Yes, the teacher in me is willing to accept the first picture as environmental and informational. The artist in me wouldn’t be happy without the portrait that follows. Thanks, Tom. Retroactive good wishes for Thanksgiving to you, too. You may be the only commenter on this post who has seen cardinal flowers in person. Lucky us. Also not surprising is the fact that you know how good a resource a long lens can be for reducing background distractions. I never thought Cardinal flower was an unusual find, not that I see it that often. A stunning flower, and hard to photograph well. A while back, I wrote an article for a photography website about angle of view, focal length, and the effect on backgrounds. A focal length of 300mm (or so) with some extension is great for flower and insect photography. It’s amazing how many people believe a 100mm macro lens is all they need for closeups. While cardinal flowers aren’t really rare here, I don’t often see them, which matches your experience. And like you, I’ve had trouble photographing the flowers well, in part because the red is so rich and in part because key components of the inflorescence sit at different distances from the lens. I haven’t had a lot of luck with long lenses for closeups, so maybe I should practice some more. The reds do tend to oversaturate and depth of field is an issue with this flower. Such a beauty, though! No doubt about it. I’m still looking forward to more portraits of cardinal flowers. I had the same difficulty at the Pineywoods Native Plant Center in Nacogdoches when I tried to photograph the endangered Neches River rose mallow. I found four flowers in a marshy area beneath and along a boardwalk, and they were surrounded by so many other plants it was hard to isolate one. Not only were the flowers poorly placed (for my purposes, if not theirs), they’re so deep that it was hard to keep everything in focus. 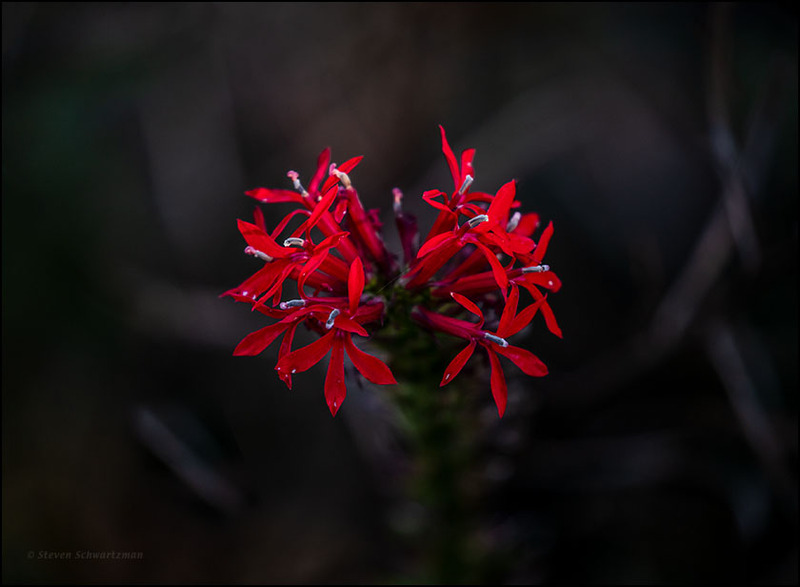 You did a wonderful job with the cardinal flower, and I’m glad you included both images. I just was looking at the plant list for the PNPC, and see that cardinal flower is listed. Perhaps next year I’ll get to see it there. I was interested in the discussion of a long lens for closeups. Last weekend I went down to the refuge despite the steady rain. I hoped it would quit, but it didn’t, so I pulled out my 70-300mm lens and shot flowers from the car. It was a little surprising to me to see how well it worked: not always, but sometimes. I wouldn’t have imagined such a thing possible. What a coincidence that we both had the same sort of boardwalk problem. I didn’t know if I could get a decent picture of the cardinal flower. The dimming light had me shooting at the lens’s broadest aperture of f/5.6, something that made for a shallow depth of field and therefore lowered the chances of keeping important parts of the flowers in focus. As you’ve seen in the comments, I included the first image for teacherly and documentary purposes only, given its lack of esthetics. Good luck with a cardinal flower of your own and also the Neches River rose mallow. Some years ago I ran into two butterfly photographers who took all their pictures with long lenses. I haven’t had much luck photographing butterflies that way. I still prefer getting close with my macro lens, but it might be worth experimenting some more with the telephoto approach. Yes, the second one’s a big improvement. We grew something related to this as cut lower back in 1986. It had the same species name. I do not remember the variety name. I think it had bronzed foliage. It is an odd cut flower crop. Designers wanted it back in the 1980s. While I’m not a designer, I still want cardinal flowers and am always delighted to come across one. Your “guesswork” proved very accurate, Steve!